As the title states this is something I have been studying for a few weeks now and I have been trying to assemble how it all fits together. I will provide you with my thoughts and ideas and anyone can also put your thoughts and Ideas on this area that got lost in the final push to release Half Life for Retail. This is not so much a suggestion but I think it could do with a resource thread and if you like it’s an assessment of this deleted area and is there enough content to make it a viable project? I won’t deny that I would like the Black Mesa Team to have a crack at it even if they did not want to it could become a Mod… But It has to be first of all viable and also have to unpick a multiplayer map and re-interpret it as a single player experience. It’s not a huge area or Large map it’s pretty small and self contained it’s a map you run over twice to the dish and back again but as we all know it has to be crammed full of stuff with a solid purpose a few giggles and some good game play to make it viable but there is no denying that it is a challenging thing to grasp Communications Center. There is perhaps debate on where it would Start… Where does this area fit into the Campaign? When I look at how “Uplink” demo is staged I see it as being straight after Surface Tension… As soon as the Roof collapses and you are given the chapter Title “Forget about Freeman” this would be where I feel the map started so you are not in the Underground Garage you are in the Communications and Administration Center with the Truss falling and are greeted by the Scientist and Security Guard. I think "Uplink is Correct here very little was Changed you are given the mission to align the Dish and so on and the Door to the Lambda Complex cannot be opened until the Task is completed. The part where this differs is I feel the Elevator is not part of this Room in “Uplink” we simply go through a Door and remain at fairly low level not gaining much height. Upon Entering this Door (Not Elevator) We now Transition into an “Alpha” map section. 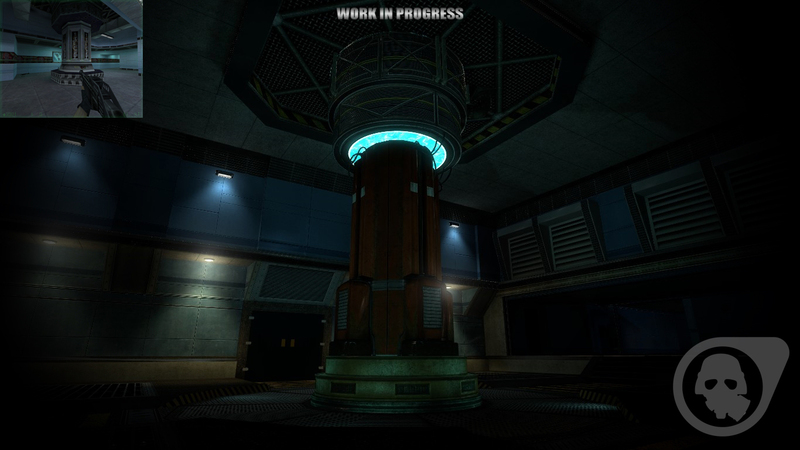 Weather this is actually the corridor section with the scurity office in “Uplink” Demo I am unsure? I Love this Rooms Architecture It perhaps has a Corridor leading to it (Uplink Demo?) you can see the Design in the Alpha … I think this area would have a few skirmish with Aliens not Grunts they come later… This small section Leads directly into Datacore. But of Note… The Helicopter Room is not included in this section… That also comes Later. Now we are in Datacore… The Security Guard Let’s you in. These 2 videos Gives us an idea of what the area was to contain. Again what we are seeing in these 2 videos is again Visually appealing the Comms Control Room and the 2 large Power Generators and the Dish. There is literally no shortage of Visually interesting areas here. If we rewind to where we are given our mission, the scientist says “The power cables are severed” This I feel must tie into the two power generators needing to be Shut down… There must be Killer electricity blocking our path to reach the Dish. I like the idea of it being in the Dark and say quite a few dead bodies strewn around but not so much in the way of enemies… traversing to the Dish you have a few alien skirmishes and Head crabs jumping out at you in the dark whilst trying to shut down the electric to make your way onto the Dish. We hear the announcemet about “Emergency Medical Helicopter” during solving the Power Generator Puzzles. I especially like the Scientist trapped in the Blast Door from Shaft. The placement of where the Dish is has to be next after the Turrets. We now enter into a Radioctive area… But going from the Admistration center to a Comm’s Dish we would need some form of Transition perhaps an elevator or not working Elevator. Or a small Surface section similar to Decay… You could quite easily see Breens office overlooking the Antenna Dish and perhaps a small surface section which you must traverse underground as the surface is too dangerous. Either Way it could be an off shoot of the return circuit on Datacore and I would vouch it is a small area not oversized. But we must also consider pathways being Blocked by Aerial bombardment and so on. Weather this was to include the need for a power loader to make it to the Dome i.e. Box Puzzle in Radiactive Area? Perhaps Similar to the Radiactive Corridor in “Decay” Either way I would assume probably revert back to something like the Dome from Uplink / Decay now although I don’t feel a dish within a Dome makes any sense at all… I prefer the Alpha with a more Roof type iteration for the Dish or Decay…anyway the Scientist at the Start of the Level Talks down an inter-comm and let’s you in. You align the Dish and then the HECU ambush ensues, you fight your way back through the level fighting HECU Grunts weather or not we take the Radioactive Sewer from “Uplink” here that joins with a part of Datacore…Then you must get back to the Computer Room where the Mission was Issued. I would Have the ambush in the Admistration center with Atrium and fight on the return trip. I would not want a massive stretch away from Datacore to get to the Dish. I wonder if “Uplink” was Meant to include the wheelchair bound scientist but he was not yet created from Decay? Perhaps Dr. Breen is on the Helicopter? This is Really all I can sort of figure out… But I still feel it’s a bit content light, I think it’s about 75% viable but there needs to be a slight bit more woven in to make it 100% viable as a restoration and I don’t know if it’s all the way there in terms of viability. My Conclusion is that it is more a Puzzle and Platformer on the way to the Dish but more action orientated on the way back to the Lambda door. The biggest problem I think is trying to figure out how the antenna Dish and/ or Dome and Radiation section would fit. It may simply be the more Blank Section without power generators on the other side of Datacore? The other thought I have had is that the Helicopter Pad in the Alpha is Where the Dish would be and you have to make your way back from here meaning the Entry point is over the other side of the map from Uplink Demo (surface Tension). Although Datacore is a Looped Map It would be a closed Loop with a Blockage so you could not reach the Main Comms Room initially from which ever way you look at it (Or the Comms Room and the Uplink Computer Room are Paired down) and you would always play through the power generator section first to then get to the furthest part of the closed Loop. Please give any thoughts you have on this cut area or section. Design Progress has been made now on how datacore if it were communications center single player chapter would have been laid out. Iteration 2 is correct. It has all started falling into place… We also have the addition of the Alpha Lobby Behind Reception placement and Breens Office Location. Upon entering his office I would not be opposed to a small video cast from him but It’s not entirely needed intercomm is much more suited to the chapter so an audio message or something would suffice, but if there were if would have to be something along the lines of “What are you doing in my office” and that he has lost all hope of salvaging the situation (nuke the place). It’s all your fault and so on… Your Fired lol. Anyway looking at the layout it makes much more sense now. So the other point of note is upon entering the area where the Dish is housed (Helicopter area from alpha) we have the observation room. This room was to be accessible only by ladder and once inside it is completely sealed off by glass doors. The player can hear a garbled transmission sound constantly. Gordon was to play with the controls and amplify the frequency so it shattered the glass of the observation room so he could progress along the raised platform away from all the radiation. He arrives at the small lift the other side and takes that up to the controls to move the dish. Once the Dish is positioned and uplink established you make your way back but hear the sound of an osprey. The Ambush takes place I feel in the Red Pillar Room and the Lobby areas with Glass atriams shattering and Hecu Dropping in and already in the area. So the Last part about transitioning back to the garage area… I am a bit sketchy on this but I simply feel seeing the “Emergency medical Helicopter” is not needed, but the vox is good. I would use the Radiactive Sewers from around the end of Uplink to transition onward to the Garage area… But in the Garage area I would put a simple crack in the wall so you could see the Nuke and perhaps hear gunshots. I would like to mark this 90% Solved and viable but there is still the case of how some routes will be blocked in Datacore and I am not sure how the blocking and unlocking part works but we now have a viable layout which is feature rich… We do not need more content particularly it is basically pretty much viable now. I would put the turrets in the Alpha Lobby and have it so Breens office has the Button to open the Door to the Red Pillar Hall leading to the Antenna Dish. Power Generators being Hazzardous and need shutting down from arcing electric. I would have the Reception area blocked off by some sort of forcefield technology that can be deactivated from the “Comms Control Center” basically we are getting a bit more area 51 in this part of the facility so a sci-fi forcefield would be interesting top secret sort of technology. Needless to say the room with all the pipes under reception and the Antenna Dish Room are full of Radiation. This is about the neatest bow I can wrap up this cut level in… And I think I have made sense of it. A little more to add… I have a feeling that the tall power generator is perhaps the updated design for the stem that the dish would sit on top of… This means that the truss and Lunar module legs with a dish on it are an outdated design. Interesting now thinking about the Lunar module legs though. Anyway It could be safe to assume that the stem design is what is in the Room from multiplayer datacore which would have held the dish on top. I would also think that the ladder tunnel up to the observation room would have the red lights in it similar to how shaft interpreted the ladder access to the dish. Thinking emergency lighting I suppose. I would place dish stem on a Cone structure. I would still opt for electrical Hazzards in the area but that the halls either side sould be done differently perhaps or that they could be data servers… But like I said this is challenging to interpret. Also with respect to the Alpha Lobby if the dish Stem is not in the communications control room that then puts breens office up the top of the stairs above the comms control room. His office has no windows but it has plenty of tv screens. The silver doors on either side I imagine to be boardrooms. Thinking about vox announcement system was it based in this area? If so perhaps we take it from being under military command and restore it to normal functionality? It could also have a fun part to.play as the announcements for this chapter are both HECU orientated and then normal functionality warnings of radiation and so on… So perhaps this is another part of the puzzle and could also be comedic and potentially interesting. It would seem looking at the announcement list Vox is restored to normal after communications center. I would have something simple after the lamba door and before sewers to garage. Rebooting the vox and taking out a couple of soldier. This would be better than a garg fight and it harkens to an unsophisticated dumb version of Glados that is of little signifficance but again it would be a fitting end before the garage area. Probably just killing a couple soldiers destroying an interface and VOX being locked up behing glass would do the trick to explain taking it off military command. Here is a quick retro fit edit for Dr.Breen he is not in the room but looking at you through a camera or something…Perhaps he is on the screen? This is the Best I can come up with from unused material. If the Button is in there to open the security doors out to the dish… There is also unused audio for saying get away from that or what are you doing… So yeah this could actually work. These will never be used anyway in any future installment as he will be something alien like “Breengrub” so his voice would be different. Alright, so, as someone who’s spent a lot of time researching the HL1 Alpha/Beta (see the mod I made many aeons ago), there’s some knowledge I can share on this subject. It’s important to note that the chapter underwent a major redesign early on in development, which is why you have the change from dark blue panel walls to the white metal ones. Consequently, the start of the chapter was significantly changed up as well, bringing it much closer to the current design of Forget About Freeman- with a few differences. Firstly, the Lambda Complex was supposed to be entered via the door right next to the canal access hatch, since the old files contain references to it being a working entity at one point. Secondly, the map with the tank right after exiting the canals was named “commstart”, so my guess would be that instead of emerging next to the tank like in the final game, you’d be emerging up in the helipad zone. In the design doc, the purpose of the helipad was to have a puzzle in which the player would raise and lower the helicopter to kill various flying enemies who spawned in. Definitely agree with the idea that the VOX systems are controlled from here, heck, seeing that there’s a transit maintenance bay not far from here (despite oddly having no visible ways for trams to get in), it’s likely even the transit system might be controlled from here. However, I’d personally argue against Breen’s office being in this area- more likely he’s somewhere in Sec D Admin, personally I’d suspect him to be in that fancy schmancy office area located within a cave we see in Opposing Force as I imagine upper level administration would want to work in something slightly less soul crushing, but that’s purely speculative on my part; my assertion that he works somewhere in Sec D still stands though. Returning to discussion of the chapter, after aligning the dish the player was to return to the garage at the start of Forget About Freeman by way of the malfunctioning elevator (which still has a changelevel implemented, though all attempts to use it kill you and transport you to the Mechanized Infantry Repair Bay). Seeing as the aforementioned Lambda Core access doorway would now be open, the player could easily progress to the next chapter. Of course, I understand you’re doing your own thing with the chapter, so by no means do you have to do everything I mentioned. Just shedding some light on how this whole mess was supposed to be pieced together. Not at all, thank you very much for your knowledgeable input… I am not really doing anything apart from trying to make sense of what this chapter is. This small journey I embarked on started when I realized parts of “uplink” go with we “We got hostiles” and quite a while ago I wanted to do something with that chapter to sort out the mess but I knew I did not have it quite right. There really is not anything that special about the missing parts of “We got hostiles” it’s fun and it’s simply trying to get the maps to line up a pretty simple task. When it comes to the “Forget about Freeman” portion it is much more interesting as it has plot and there are quite a lot of possibilities. We must remember that “Uplink” includes the cut plot, this is a fact. The plot that is contained within “Uplink” is quite simple, and it’s also in line with the game re-design that what they were trying to achieve was over complicated. What become obvious when you look at “Uplink” is that they cobbled parts together to make it. you can clearly see where the edits we’re made and so on after the copy and paste. But we know that “Datacore” is the true campaign map for “Uplink” plot. I think the lobby does go there it fits… The only reason why I say “Breens office” is there is because I think it looks Regal and Plush and also he would be situated in a place where all communications and security video systems and warnings and alarms over the entire facility feed into. If you we’re looking after something the size of Black Mesa you would not want to be tucked away in a cave, you would want to be in the central communications Hub where all the information systems were and also being in charge of the whole facility he could also communicate with the whole facility from this point. I don’t have any hard feelings on it but it does look like somone important is there. Simply because I looked at the design of “Uplink” and then the design of “Communications Center” I simply made the connection that raising a helicopter up and down was just silly and having a dish above “datacore” was silly in a way and the best spot for the dish is the Helicopter Room about the same size and it’s a perfect little off-shoot. I then realized after there not being a need to raise and lower a helicopter this room had to have some purpose. So I thought the equivocator fitted nicely with the fact you can also see the transmission dish you are about to tune. Although the updated design for the Dish Stem is in that Computer Comms Control Room, I think the power generators are simple enough and it is good enough but they just need to look different. I would lose the Gantrys I sketched in because the Gantry is the passage out to the control for the Stem on the dish… So the Gantry is up high in the Helicopter Room not in the Halls. I would probably keep the Gantry between the two blocks though on the right hand side of the Plan view. I just swapped a radioactive sewer from uplink for the one that comes later in retail…The thing is it makes no sense to interfere with this part I would surface in the corridor / room after the Ceiling collapse… It also is not in keeping with the plot of what “uplink” is a trip to the dish and a trip back being ambushed and to get through a door you otherwise could not progress. Perhaps the Plot is a bit rubbish in a way… But it is funny when you think about they are sending the “all clear” whilst the situation is getting worse and a nuke is being prepared… The comedy level is high. But I would not be opposed to that being mixed up as you say the Satellite could have a greater purpose to try and contain the portal that lowers the Security Status allowing the door to open. In fact I would be 100% behind that small alteration as it feeds more into the overall narrative of the story to try and contain the situation with science rather than violence. But it obviously only does so much as the portal is being held open from the other side. Perhaps they very nearly close the portal the door is opened then Niahlanth tears it open again… Shock Horror “The only way to shut the portal will be from the Other side and stop whatever is keeping it open” It’s still funny because they could be congratulating each other until obviously the portal tears open again. I suppose you can either make uplink Plot area white or you can make keep datacore being blue… I think I prefer the blue because it matches our familiarity of that first room in “uplink” and then would continue to look like you are in the same part of the facility. But I agree that if it’s dark and has emergency lighting then white would show that better and be more reflective. The blue matches the Lobby much better though. I am indifferent about this but I really like the red pillar hallway it is very iconic but lacing radiation in from after this room I would consider a certainty. Reference to turrets in the Lobby… Breen activated not Laser activated? Thanks again for your input What would you imagine Vox to look like? I kind of see it as a big metal box perhaps resembling a mouth with teeth Computerised Harmonica? Although I am not fussed with time of Day at all… There is another thought I had that Perhaps Gordon got knocked out in the air raid… When he comes around and wakes up (scientist with a syringe ) it is night time and over hears the conversation between the scientist and the security guard. This way we can have the Black screen messages. We can also swap day for night for the skybox for aesthetic purposes that then puts the outdoor area of forget about freeman at dawn. At the end of the day I am not pining for cut content merely trying to understand the cuts but If someone wanted to take the ideas on or even if Black Mesa did something in a future update then whatever this a resource for this part of Forget about freeman. If someone wanted to Mod it I could help out in a limited capacity as I get too busy to do anything most of the time so while I have a bit of Spare time I devoted some time to fleshing this out . As far as I am concerned these are not my ideas just interpretations and anything here is for the taking. But this has got better and better so I know that it is good shall we say… I can’t say the same for “We got Hostiles” it is plain but fun and not as interesting. The next place to look is steamlabs HL2 deathmatch. I can’t really find any secrets contained within it or particularly straight up stuff that reveals something or any more clues about communications center particularly. I think the most Steamlab honestly reveals is that the SLAM weapon was introduced and shipped with “Steamlab” update for HL2DM and they are actually a model of active speakers so there is a design cue to the speakers in the observation room. Any other design cues presented I am not particularly sure what to make of them. I will list what I was feeling from walking around it and looking at it. Fences can be swapped for glass. hollowing out (alcove) areas of certain solid walls is fairly interesting. Lots of Pipes which it’s nice to see models rather than bare bones but not sure it fits datacore. Possibly swap for trunking or cat5 cable runs. 2 death traps involving valves and pipes… I could not really see any design cues here perhaps more so the secret offshoots. Did consider the one in the Hall is by a power generator box. The other is the real pipe room from Datacore under reception nice secret passage but in no way is this single player design. Merely decorative. I was really hoping high on those death traps for something I think not use able red Valves in the pipe room would fit though and the alcove here. So I think it’s quite limited what can be taken away from this but there is something. You got the speakers for the Observation room just need to change the color from green to Black / grey. Brush based box on the back of the model probably. I think it’s a straight up homage but some small ideas never hurt. Originally, the scientists needed to triangulate the source of the portal activity, and (obviously) needed 3 different detectors in order to do so. There is a protocore and also reactor Lab which I think ties in to what you are talking about here… I am not sure this is Datacore though? But it could be used for design cues… It seems to me we are looking for as you say 2 things in either hall and the third part of the triangulation would be the satellite. We need to design what the 2 things in each hall are even if merely aesthetic I would like to assume that they are Large Data Processors. For the Actual Processor core I would probably go with something like the rollermine. This could act as a model for a powerful CPU. But it would need to be housed within a structure, but I like the sunken floor of the Protocore although it’s also too big for the Halls. It might be good to use the design in protocore but on a much smaller scale and house something coming out the floor… But we are looking for some sort of circular design I think for the Data Processors. It would also feed well with combine design if Breen is included in communications center. Seeing a pre-combine tech breen had developed that resembled the Power generators we see in Half life 2. More so the horizontal Generators I feel. The Dynamic prop lift (yellow) from HL EP2 from the Antlion Hive would make a good lift for reaching the stem of the Dish. Operation Black Mesa Interpretation. They got the symbol correct looking at the floor. The Original Brushwork on this thing now sort of gives a bit so the Texture that is sunken on the Cylinder should be transparent? Red / magenta Portal = Separated? Alternate Dimension. ^ not sure about this just popped in there… But I would say if there is any weight to this we need to see something running looped / a perpetual object on a loop and it’s yellow and Blue within that cylinder. Breens CPU the “dogs ball” (man made replica of energy Ball)? My Best Guess and Conclusion. I think the Cylindrical Generator is the Energy Core for the shield walls. And we also have a Coolant system. We have to make the generator overheat in order to activate emergency power and this powers down the shields and then we can get to the reception and Lobby. The Severed power cables block your path from the entrance to the Pipe Room meaning you need to traverse the whole map before reaching the Valve or final Valve to overheat the generator. So this Room at the end of the Lobby… The Gman was revealed to be the administrator in the files of Half life by some cut audio or something but obviously that was changed. Dr. Breen was put in as an interim administrator by the canon wiki. So the G-man was administrator prior to Dr.Breen? In this Beta Half life 2 clip Marc Laidlaw tries out a Gman sequence but it also seems like it’s not in person apart from the hallucination text. The G-man sequence is meant for being on a screen. I would also say this ties in better than any sequence that Dr. Breen could provide. It’s a posh office Gordon should not be in. When we think about Half life 2 and Breencasts there are occasions when the video flickers between G-man and Breen. So I think this actually fits where as Breen making an appearance does not. I would vouch for the quick flicker on a screen also. I am aware the female scientist that was to betray you… guess what she had x-labs on the back of her coat. She was the Head scientist by all accounts. What this does mean is that x-labs and communications center were amalgamated I think. This is again a pairing down perhaps… You could actually imagine the multplayer iteration of Datacore being part of questionable ethics right? THey said they did not have the technology to pull the sequence off in Half life… Does this mean the video screen effects for the G-man scene if the female scientist was written out and x-labs was paired down with communications center? Well, yeah it was part of that before it was moved probably because of the CENCOM signs make this clear. So the white iteration and pipe walls for Datacore are correct upon the separation from questionable ethics to forget about freeman. I will simply highlight what I think is part of this missing map. Forget about Freeman Leftovers - yep in uplink and part of communications center. Carpet Textures - yes this is the floor for the room at the end of the lobby. Department of Defense Logo - yep it is on the floor in the Lobby. Alternate anti mass Spectrometer floor textures - Yes this sit’s around the Generator in Datacore all the cooling pipes might be much smaller scale when compared though. it is also the symbol for the citadel. Gear Textures - yes this is the Valve sockets on the pipes. City skybox - probably… It ties in to the skyscraper Breen has in Half Life 2. Unused Pictures - White house only. Cut forget about freeman signs - yes interesting “Black Mesa East”? This is perhaps the most I can make out… At the end of the day it was an unfinished idea, but tried to fill in the gaps. Is Alyx Vance on the Emergency Medical Helicopter? In Half life Absolute Zero we have a Room with a Fan accessed by the empty hall way but they put this as the Central communications Control… Is this the Data operations Room or Data Processor Room with Fan cooling?